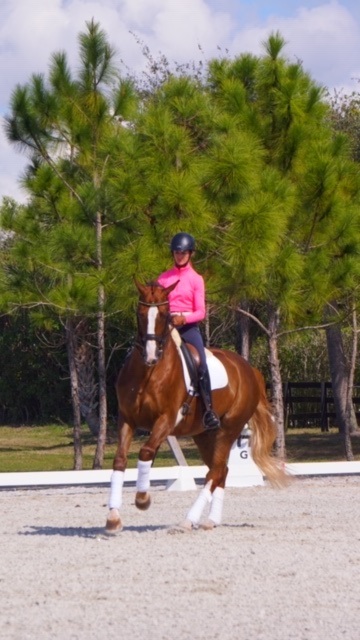 Klaus is by San Remo and has an FEI passport. This is a horse who wants to show off his talent and is always willing to go for the maximum for his rider. 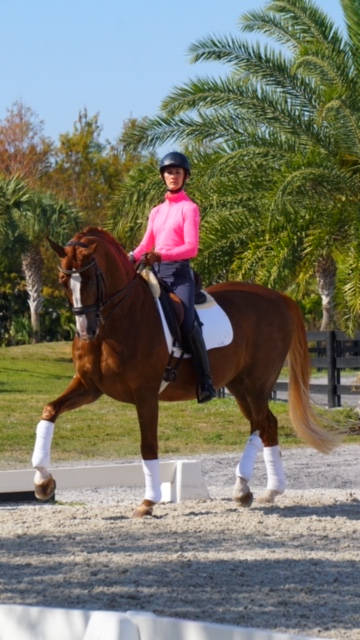 Klaus easily offers flying changes, pirouettes and extended trot are among his favorite moves! He has outstanding shoulder freedom from nature and always stands out on the showgrounds. He was gelded late and has the 'look at me' presence of a stallion. He is forward but not hot and if you ask for more you will always get more but his basic character is very laidback. Klaus loves people and is a total gentleman. He lunges, hacks out, and loves cavaletti work. I have many videos posted on my Youtube channel Kelly Layne Dressage. Klaus is very amateur friendly in every way and an absolute pleasure to handle in the stables. I believe he is most suited to a Junior or Young Rider or an adult amateur seeking the CDI arena.